UPPERS: Upper constructed from an innovative combination of high-techouter material, lining and membrane. Ultra light weight with class leading waterproofness and breathability. TPU overlay for added lateral support. Rubber toecap for protection. LINING: Extra-hydrophobic lining with H2O- finishing and high-performance Sympatex® membrane. Fast and effective transport of sweat away from the foot. MIDSOLE: Boreal PB-60 with EVAtop sirafec layer for added underfoot comfort. USAGE: Light weight Trekking, ultra light backpacking, fell walking, 2-3 season use. Travel. The upper is made from a unique high-tech three layer laminate material with a Sympatex® waterproof breathable membrane and a hydrophobic mesh lining. 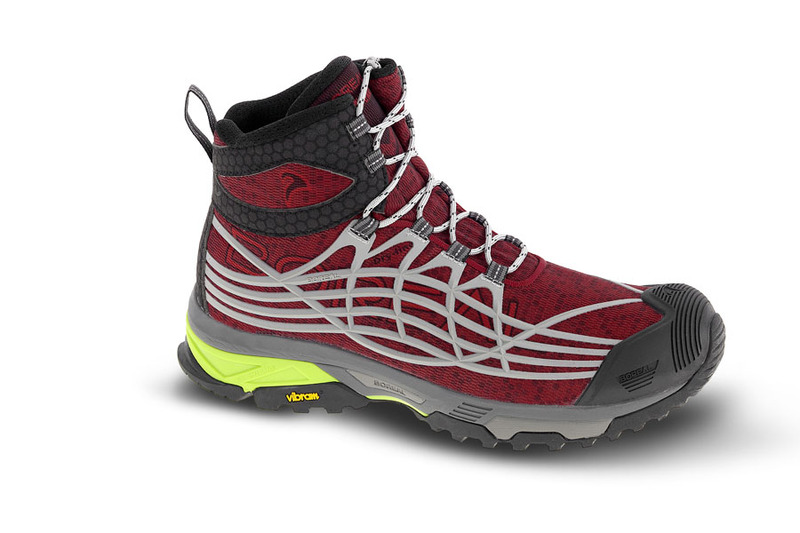 An injected TPU lattice provides great support and protection to the upper with minimum weight and an injected rubber toe cap adds useful protection. The very low number of seams and soft nylon tape lace loops gives Hurricane an outstanding sock like fit, and the breathability of the upper to moisture vapour far exceeds the performance of traditional waterproof designs.